Having the freedom of cloud infrastructure can be liberating but sometimes you just want a simple and easy solution to develop and deploy web applications. Dokku is an extensible, open source Platform-as-a-Service that can run on any single server of your choosing. With Dokku CentOS you can easily setup your very own PaaS in a very small implementation that is not hungry for server resources. Powered by Docker, Dokku can help you build and manage your application lifecycle in the cloud. This guide will help you get Dokku CentOS installed, configured, and tested, along with tips on getting the most out of your personal cloud platform. The instructions in this guide are intended for CentOS 7, but Dokku is also available on Ubuntu as well as on Debian. The commands above will install the required dependencies such as Docker Engine and Herokuish along with Dokku CentOS itself. The installation takes only a couple of minutes and works the best on a freshly deployed system. When the installation is complete, you will need to add your public SSH key to allow remote application deployment. All keys should be added under the dokku user account that is used to manage the application. Set at least one SSH key or include multiples each in their own files in the /home/dokku/.ssh/ folder. If you already included an SSH key at the server deployment it should be stored in /root/.ssh/authorized_keys. Dokku will edit its own authorized_keys file for its requirements, copy the key as a new file into the Dokku user directory. Then include the key file in Dokku. In the Dokku CentOS version 0.8.0, virtual host naming for apps is enabled by default. You can verify this by checking that your domain name is set correctly in the /home/dokku/VHOST file. 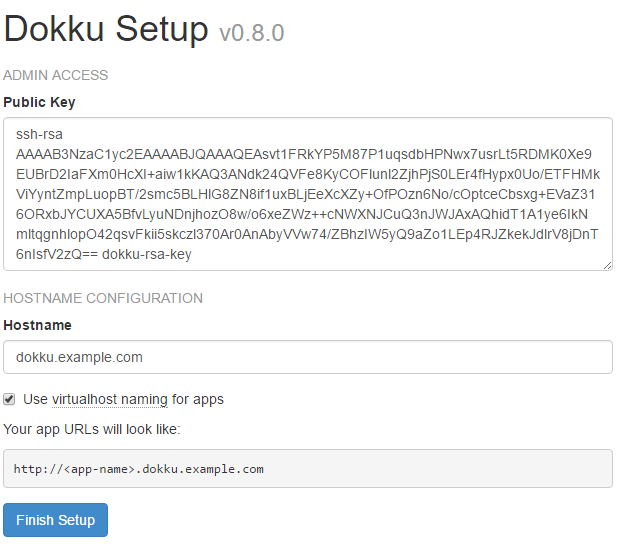 The feature configures applications under <app-name>.dokku.example.com subdomains when deployed on Dokku. Make sure to configure a wildcard A record for your domain to allow access to the application subdomains. If you do not have a domain name available, you can use the default reverse DNS name instead, set it in the VHOST file. Your Dokku CentOS platform should now be installed and ready to deploy applications. Continue below with testing the platform with a simple example app. Once the deployment finishes, the application should be available on your Dokku server at the URL shown at the end of the output ruby-rails-sample.<dokku.example.com> for example. CentOS firewall blocks access to the HTTP port by default. Use the command below to enable the web service. You can then click the link in your terminal or browse to the address to test the application.